By 1962 the Belle Vue British Legion were utilising the old station house at Belle Vue St. Note the extra front window exactly matching the original two either side, but replacing the old Lancashire County 'Police Station' inscription and the date. By 2012 the street and premises remain as a social club. Manchester City Surveyors Plans 1900-1910 photocopy held at GMP Museum & Archive: Old Police Buildings. June 5th 1890 C. C reports on the 24th Articles of the Provisional Order of the Local Government Board re the amalgamation and take over of the the police Stations; Blackley, Crumpsall, Gorton, Miles Platting, Longsight, Openshaw and Newton Health form the County. 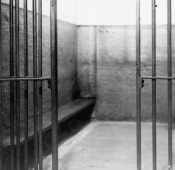 Dec 31st 1890 LUSC: only two cells at this station. July 23rd 1891 Twinquennial valuation of properties owned by the W.C only: Not assessed. Sept 8th 1892 Painting £10. 19th Oct 1893 H.M.Gov tax assessment of the Belle Vue St and South St PS. An appeal against the property tax by the Town Clerk. 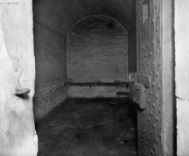 26th July 1894 The cells are infested with bugs and the prisoners complain of them. All steps including paraffin oil, carbolic acid, painting and new beds have been tried to no avail. 6th Sept 1894 Plans for additional cells and alterations to include 205 yards of superficial land and also additional vacant land behind the station be acquired on reasonable terms. 17th Oct 1895 Poor rate assessment appeals; Cavendish St £216.15.0, Belle Vue St £13.10.0, South Street £10.5.0, Goulden St £184.8.0, Park Place £10.0.0, as premises used for the residence of a police officer and his family such parts are rateable. At that time Cavendish St not occupied and an Inspector and his family were at Belle Vue St and a Constable and his family at South St.
20th Feb 1895 Visit of the LUSC – requires painting and beautifying and remove offensive smells. Repair to flag staff and lightening conductor. 27th Feb 1896 City surveyor’s plans for additional cells and alterations to erect a mortuary and pound behind the station to be approved and adopted. 21st May 1896 Quinquennial Valuation and Inventory of Furniture of properties of the WC. Closure of following stations except for prisoners in emergency – Newton St, Fairfield St, Lowe St, Brook St, Ashton Old Road, Belle Vue Street. To build new stations at Mill St Bradford. 1901 Caminada’s report details station as unnecessary with the building of ‘a sub-station in the most thickly populated part between Hyde Road and Stockport Road’. 29th March 1900 LUSC: The substitution of a self acting w.c in lieu of those provided in the cells of the various police stations. 15th May 1901 Quinquennial Valuations: £924. Dec 11th 1930 Sold by the Town Clerk. 2012 Street and premises remain as a social club. Note: original front door lintel remains seen from Belle Vue St.